For more than 2 decades, Kathy Vincent, The Scripture Lady, has been sharing the Bible in creative ways to both children and Christian teachers. Through her Bible Song Programs and Teacher Training Workshops she has encouraged thousands to grow in God’s Word. 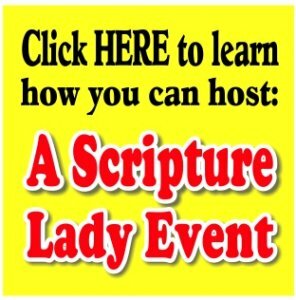 Perhaps you are in need of some encouragement of your own and maybe hosting a Scripture Lady event would be just the thing your ministry needs to instill new creativity into your children’s programming. 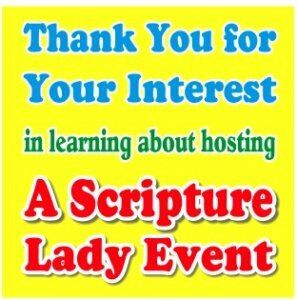 The Scripture Lady offers two kinds of events. * any time you want a meaningful, creative, musical presentation of God’s Word at your kids’ level of understanding. For the encouragement of your teachers, Kathy offers several teacher training workshops for both the beginner and veteran Christian teacher. The Scripture Lady believes that effective teacher training leads to effective teaching, which leads to effective transformation in the life of a child. To learn more about either of these events, please click on one of the buttons to the left.